It’s no secret. The future is all about automation, and that future is now. Every industry from automotive and financing to customer service and food service is turning to automated solutions to improve productivity and better serve customers. The market for automation is so large, in fact, that the robotic process automation (RPA) market is expected to reach a whopping five billion dollars by 2020. While widespread industry adoption is common in many verticals, the insurance sector has lagged slightly. The automation wave, however, is surging quickly and insurance providers who have already caught that wave have found incredibly positive results. If you as an insurance provider don’t want to be left behind, it’s time to adapt and adopt an automation solution. While automation sounds like an appealing idea, there are, understandably, some barriers to entry. Automation can seem scary and sound hard to implement. For many reasons, change is difficult, but it could make all the difference. Turning to an automated insurance agency document management system are we…or are we a DMS for insurance agencies…this error repeats throughout.can be nerve-racking to say the least. Adopting a new machine- as opposed to human-run solution can bring some anxiety. Will the system be able to sort and store files in the correct manner? Is it worth the investment? What about security and compliance? These are all valid concerns and if they aren’t addressed, automation can certainly seem like a scary prospect. But automation doesn’t have to be scary, especially if you find the right solution. Here are some reasons you may be scared to implement an automated insurance agency document management system (or insurance document management system), along with why you shouldn’t be scared. Implementing a new insurance agency document management system can come with a lot of unknowns. While you may be excited at the prospect of lessening the amount of paperwork and menial tasks that consume so much of your daily time, you may feel slightly apprehensive or hesitant to try something new when it comes to insurance document management. After all, maybe you have a way of filing that already works well. You are used to your paper and filing cabinet system and you’ve been doing it that way for years. If it isn’t broken, why fix it? While the way you manage insurance documents may not be broken, it could certainly be improved. And that improvement could save you or your staff several hours per week. Some have found, in fact, that insurance document management software has saved them as much as $72,000 per year and 80 hours of paid labor per week. Some of the biggest concerns to you as an insurance agent are security and compliance. It’s understandable, as it’s likely that the insurance industry is one of the largest targets of data breach, falling closely behind healthcare as one of the most targeted industries. Compliance is also a considerably large concern. Document retention and governance regulations mean you need to be wary of how and how long you file documents. While your current way of storing and sorting documents may feel secure, it’s likely that automated insurance document management software will only enhance security. Yes, a filing cabinet that is meticulously managed and organized can feel concrete and comforting, but there is a better way. The security that comes from a password-protected, cloud-based solution with encryption capability keeps documents secure and accessible only to those who are authorized. Adopting a whole new document management solution can certainly seem like a big investment of not only money, but also time. After all, you are busy enough as it is. The idea of adopting a new solution can seem daunting. At the outset, you may have no idea how much it will cost or how many man hours it will take to implement. Switching to a new solution rarely comes without growing pains, and it’s hard to rally yourself to take the plunge. The great news is that an automated insurance document management system may be a lot more affordable than you think. For only hundreds of dollars each year, you could very realistically save thousands. And if you are worried about the time taken to implement the new solution, don’t be. Many document management solutions provide personalized service from product experts who can help you custom-tailor the solution to fit your unique needs. With the help of a seasoned implementation specialist, you’ll save time and money and have your system up and running in no time. So many document management solutions promise the world and don’t deliver. Maybe you’ve been burned in the past when you tried to turn to an automated solution. And while many document management solutions have a lot of functionality, learning how to use those capabilities can seem difficult. Here are some worries that may be causing some anxiety when it comes to selecting an automated document management solution for insurance documents. Shifting over to a new system often means a lot of learning and likely a change in the way some processes are run. You are busy enough as it is, and taking time to implement a new system may seem like it will slow you down. Implementing a new solution may be a lot easier than you think. 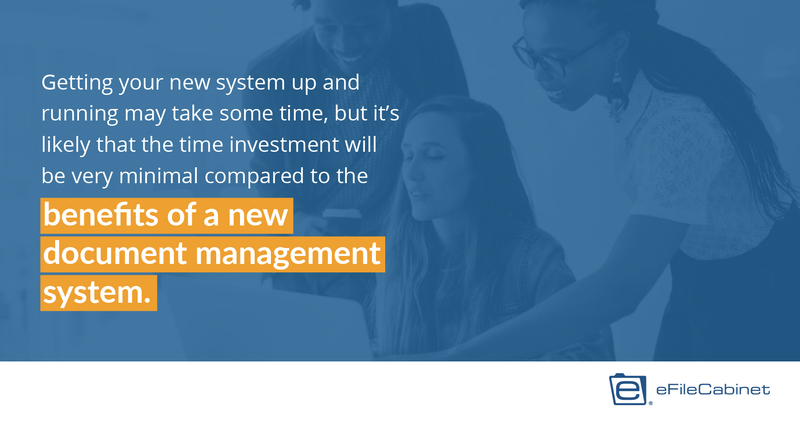 Getting your new system up and running may take some time, but it’s likely that the time investment will be very minimal compared to the benefits of a new document management system. What are you going to do with all of your current file cabinets full of documents? How long will it take to convert them into a digital format and file them correctly within a new system? With many solutions, it doesn’t take long at all. eFileCabinet, for example, is trained to recognize specific document types and sort them into specific predetermined files using templates. And those templates are also completely customizable. Whether you accept it or not, the world is shifting toward automation. Don’t be late to the party. The great news is that within the insurance industry, there’s still time to get on board. While there may be a certain level of comfort in holding out and continuing to file documents the way you always have, embracing change and automation will bring relief and clarity. If you’re not ready to implement an automated solution, it’s best that you take some time to consider the negative consequences of not going automated. While you are stuck fumbling over loose documents and renting out extra space to hold filing cabinets full of papers, other agents are going fully automated. It’s time to jump on the wagon, or you’ll be left behind. It won’t take long before the entire insurance world is fully automated when it comes to document processing and storage. If you haven’t implemented it as an insurance agent yet, you may find that customers will take their business elsewhere and find another simpler solution at an insurance company where they have more personal access to their agent since they aren’t drowning in paperwork. We’re with you. Change is difficult, and it takes a lot of trust to put your document management in the hands of a new automated system. When it comes to implementing a new solution, there’s no time like the present. If you’re worried about committing before giving things a test run, have no fear. At eFileCabinet, we offer a free 14-day trial. If you’re ready to learn firsthand how eFileCabinet can help you reclaim your time and better serve your clients, give us a call or request a free demo. The automation wave is growing, so catch it and reap the rewards.